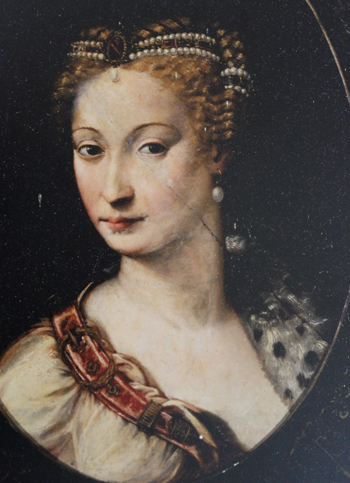 Diane de Poitiers was the mistress of King Henri II and cousin of Catherine de Medici (Henri’s wife). Henri adored Diane and had the medieval Chateau d’Anet redesigned for her in 1548, commissioning architect Philibert de l’Orme. 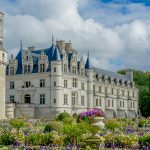 A master of the French Renaissance style, his other major projects include the Chateau de Chenonceau and major modifications to the Chateau of Fontainebleau. The marriage deal of Catherine and Henri II was signed at the chateau d’Anet. They wed in 1533, when they were both just 14 years old, but the vows didn’t change anything. It’s thought that Henri met Diane that same year (she was 20 years older than him) and he remained true to her throughout his life. 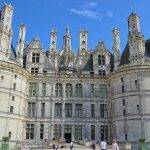 The chateau is an incredible sight, a masterpiece of the French Renaissance. 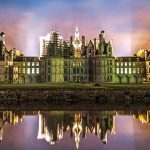 Viewed from the road, it quite takes your breath away with its stunning stone gate, topped by a stone stag and hunting dogs, plus a plethora of towers and turrets and tall chimneys. There is a beautiful Chapel with an extraordinary domed ceiling where Diane de Poiters used to attend mass. Mary Queen of Scots, married to Henri’s son, also came here to pray as well as Princesse de Lamballe, favourite of Queen Marie-Antoinette, who spent her last few days at the Chateau before losing her head in the French Revolution. Inside the chateau is no less impressive and what also makes it an absolute stand out place to visit are the contents and elegant interior. 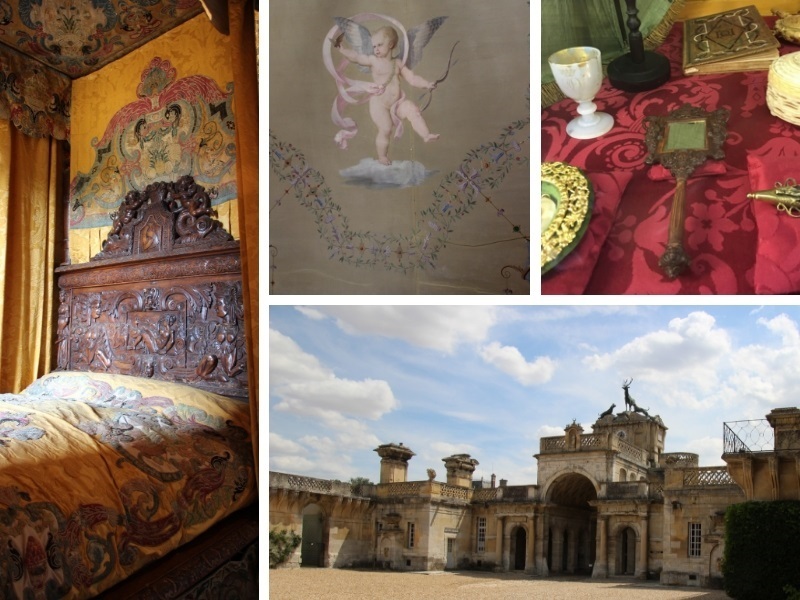 Incredibly Diane de Poitier’s bed, a historical monument in its own right, is wonderfully preserved. Her jewellery box, in which she kept many of the crown jewels the King showered on her (returned to Catherine de Medici on the King’s death,) has survived intact. A hand mirror, silk umbrella and other knick knacks as well the King’s closet in which he kept his clothes when he stayed here, are all on display. A door panel, beautifully illustrated with cherubs and birds bears the date 1552, the year the chateau was completed. 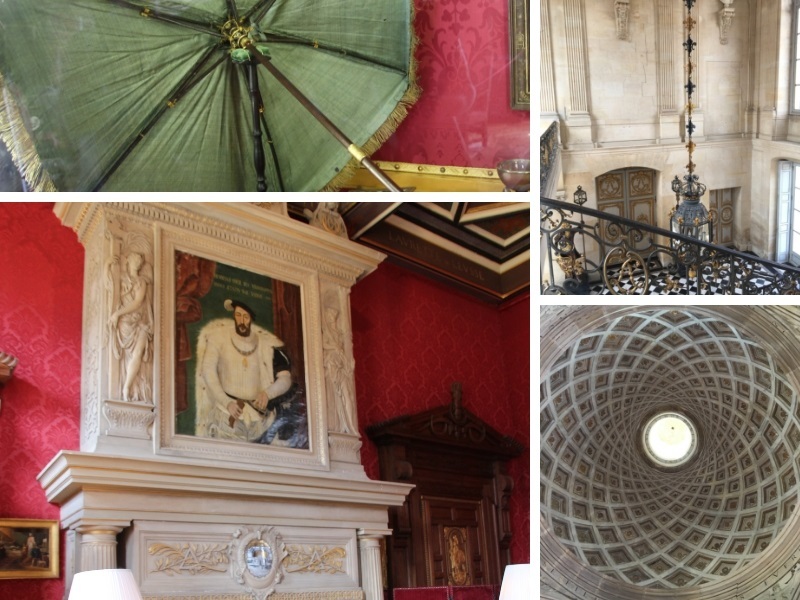 It really gives an intimate feel to the chateau, bring the past alive. There’s even a lock of Diane’s blonde hair in a glass cabinet. In a rather macabre event during the French Revolution, her tomb was ransacked and her perfectly embalmed body, dressed in her best clothes (as well as the bodies of her two grandchildren), was extracted. Her hair was cut off to be kept as souvenirs. The bones were transferred to the paupers galley in the town churchyard. In 2008 the remains of an elderly woman and two children were found when the site was excavated. Scientists confirmed the bones as those of Diane. One of the facts of proof was the traces of gold found in the bones (250 times the normal amount). She was known to consume small amounts daily, believing it made her complexion bright. It also made her teeth fall out and she had false teeth made from animal bones sewn into her gums. Her beauty regime was famous even then, she was known to bathe twice a day and, rare for the time, didn’t have fleas! Henri II was fatally injured in 1559 whilst wearing Diane’s colours to a jousting tournament at which he was pierced through the eye by a splinter of wood from a lance. On his death, Catherine banished Diane from court. She retired out of sight of her bitter rival, spending much of her time at Anet where she died at the grand age of 66 after a fall from her horse in 1565. 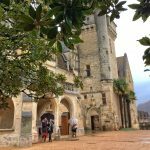 Though you might never have heard of the Chateau d’Anet, it’s well worth a visit. The gorgeous gardens were re-designed by Louis XIV’s favourite gardener André le Nôtre in the 17th century. 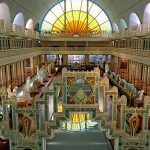 The interior is filled with wonders. Diane had exquisite taste and the monogram D and H clearly remain, intertwined forever. The fleur de lys symbol is everywhere too, beautifully adorning the chain of a lantern, embossed on the door of a carriage and on a leather chest. At the chateau a love letter from Henri II to Diane is framed, in which he tells her when he’s awake, she’s in his thoughts, when he sleeps, she’s in his dreams. 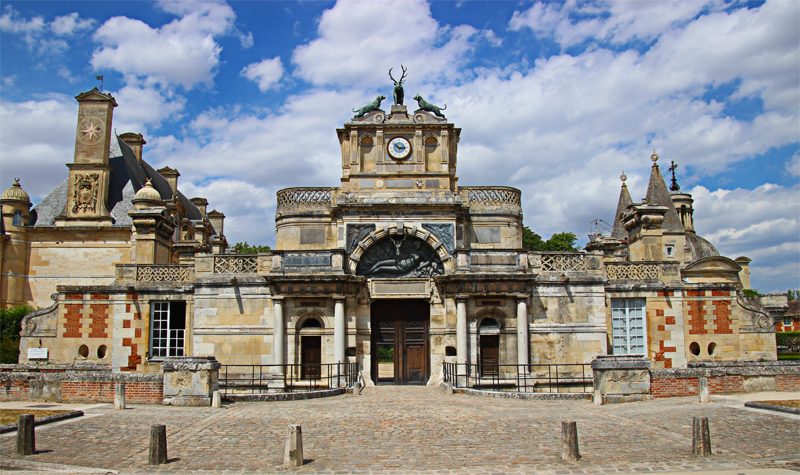 There is a beautiful chapel on the site and you can also visit the tomb of Diane de Poitiers. She was reburied with pomp in her chapel at Anet in 2010, witnessed by Princess Marie-Christine de Kent, a direct descendent of both Diane de Poitiers and Catherine de Medici. The chateau is privately owned and the owners live there but open it is to the public year round (check the website for details). Though you must take a guided tour which is in French, there is an English language leaflet. Opposite the chateau, Le Manoir d’Anet restaurant has a lovely outdoor terrace looking onto the Chateau and has a terrific menu.